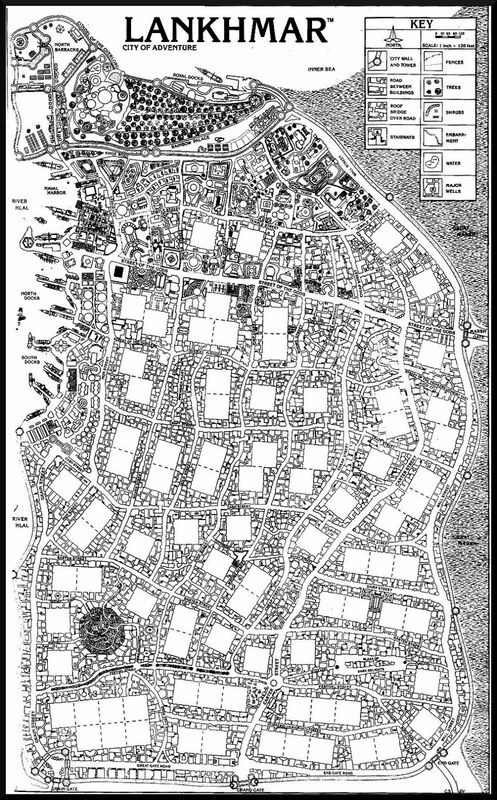 In the course of the AD&D adventure The Silver Key, characters infiltrate an orcish city called Krimba Hai. For a variety of reasons, only one of which is not knowing their way around, characters have a tricky time navigating the city. Even when they know where they need to go, getting there isn't easy. 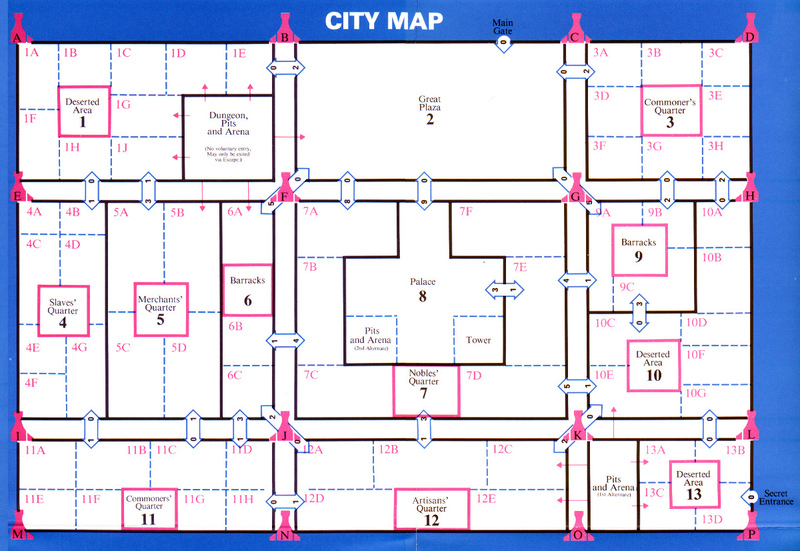 To reflect this, the city was portrayed as a flow chart rather than a map. To get from where the characters are to where they want to be, they must roll a d20. The right roll takes them to their destination; the wrong roll gets them lost, moving in circles, detected as interlopers, or into a very bad neighborhood. The city is represented not by streets and blocks but in an abstract way that reflects what characters are likely to see, hear, and meet at any given moment. The DM is freed from worrying over whether the characters turned east or west when they left the temple and allowed to focus on story and events. I believe this approach has a ton of potential just waiting to be explored more fully. Krimba Hai used a simple layout with just nine boxes. A flow chart like this can get very complex in structure and still be quick and simple to use. 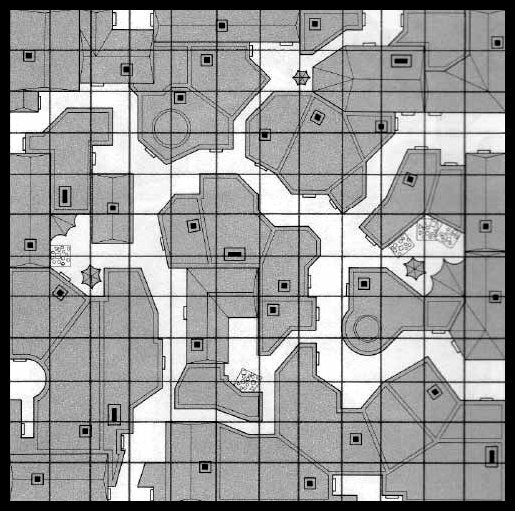 Here we cross from RPG products into the realm of boardgames -- or wargames, as the case may be. John Carter was published by SPI (Simulations Publications, Inc.) in 1979. It was designed by Mark Herman, developed by Eric Goldberg, and the graphic design was handled by Redmond Simonsen. That's a super-team if ever there was one. John Carter couples several standout features with a few oddities to deliver a game that's less fun than it is ... intriguing. One piece of brilliance, however, is the city map. The amount of functionality packed into that three-color display is staggering. It's divided into 13 areas, indicated by the red boxes numbered 1 to 13. (The Great Plaza and the Palace are slightly different in that they don't have red boxes, but that difference isn't important here.) 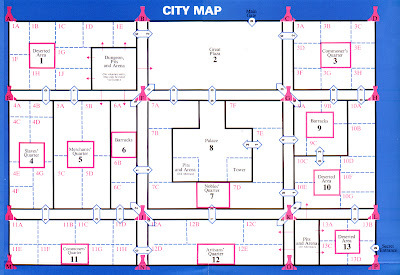 Each area represents a city district: commoners' quarters, merchants' quarter, barracks, etc. Because this is part of a boardgame, the display is meant to have pieces placed and moved on it. A character who's piece occupies a red box is in that area, moving around, talking to locals, interacting, searching. 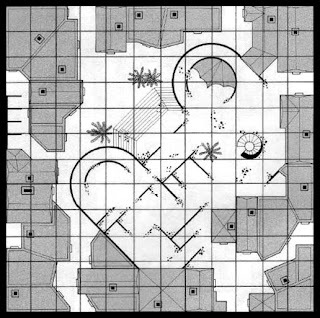 The adjoining boxes, marked off by dashed lines, represent specific locations in the larger area (called "houses" in the game). Because the display is generic, those locations have only a number/letter ID. In a specific city, area 5A could be "the home of Megos Skarte, unscrupulous caravan master." Each district has its own encounter table, with outcomes varying by whether a character is in the general area box or in a specific house. Here's where things start getting brilliant. A red "tower" stands at every corner, lettered from A to P. This display suffices for all 26 Barsoomian cities in the game. The cities have different layouts because they use different parts of the display, defined by which towers mark their corners. The great city of Helium uses the whole thing, having its towers at ADMP. The cities of Duhor and Kobol are smaller; their corners are ACMO and BDJL, respectively. Onvak is smaller still, containing only areas 4-8 (towers EGIK). The crumbling city of Exum is tiny, defined by towers GHOP so it contains only a barracks, two deserted areas, and a small arena. A character who wants to move from one district to another does so along the blue arrows. Each arrow contains two numbers, which indicate the chance of running afoul of city guards, private security, spies, or informants. For example, no one is likely to pay much attention if you travel from the Nobles' Quarter (area 7) to the Artisans' Quarter (area 12); there's only a 10% chance for trouble, represented by a 1 in the arrow. Going the opposite way, however, ups the odds to 30%; the nobles are more concerned about riff-raff slipping into their neighborhood. Try sneaking into the Nobles' Quarter from a deserted area (area 10) and the odds go up to 50%. What business does a gutter rat like you have in the Nobles' Quarter? 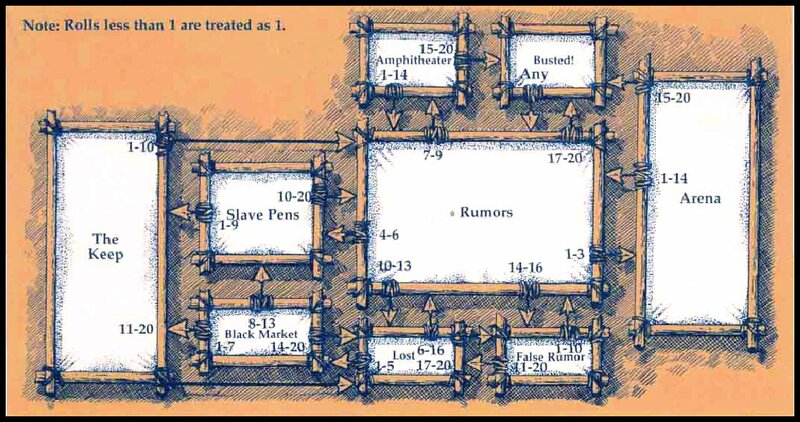 A map like this is at its most useful in a setting that focuses on skulking in alleys, ferreting out information, making surreptitious contacts, and avoiding imperial entanglements. Being an actual game board gives it a big advantage in a game. It tracks information in discrete packets. Characters are either here or there. They are either searching for Illall's Lustrous Eye in the vicinity of the temple, or they are not. These types of distinctions simplify the DM's life tremendously. The display has a clean elegance that appeals strongly to my desire to keep things orderly behind the game master's screen. The John Carter map could be adapted to a specific campaign easily enough. I've experimented with drawing generic districts on 3x5 cards that can be mixed and matched in any arrangement desired. Shown here is the Market Quarter. 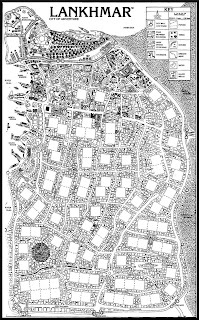 It consists of a central plaza (a common feature in fantasy worlds -- every 'hood is organized around an open court of some type) with eight distinct locations. 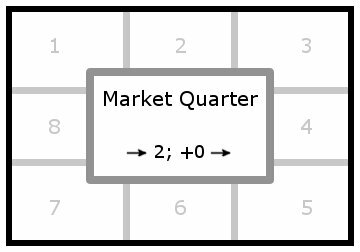 The arrows indicate that characters moving into the Market run into trouble on a roll of 1 or 2 on 1d20, and a modifier of +0 applies to the roll when they enter a different district from the Market Quarter (leaving the Market doesn't arouse much suspicion, by itself). In case my gushing hasn't been blatant enough, let me be perfectly clear: I exalt John Carter's city map. 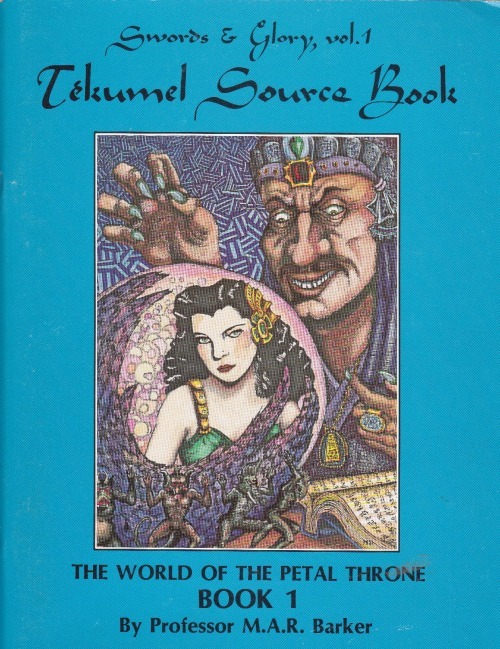 It's a shame that more roleplayers aren't aware of it, but not surprising, since it was published 33 years ago in a wargame that never sold especially well. It's an outstanding example of solving a problem through creative graphics. SPI did that so well and so often that, paradoxically, they get less credit for it than they deserve. Outstanding article! I'll get a lot of use out of this advice. That first comment may be from a bot, but I agree with its suspiciously generic praise. You've written a fine article, providing modern-day role-players with some great hints on how to make city adventures dynamic. I found your account of the John Carter game particularly intriguing. Do you have any plans to make your index cards available to the public? You're probably right about that first comment. I try to be ruthless in hunting those down and exterminating them. The fact that this one eluded my patrols for four years bends me toward mercy, in its regard. I shall let it live. No plans for the index cards specifically, but I am working on a new series of posts about using a standard deck of playing cards to build all sorts of layouts that are useful in RPGs, similar to what I did with chase scenes. Those will appear primarily at Kobold Press, but I'll link to them (and probably provide expansions) here.